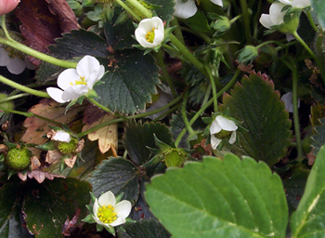 The cultivated strawberry plant, Fragaria X ananassa Duch., is a member of the Rosaceae, subfamily Rosoideae, along with blackberries and raspberries. 1. Short-day or June bearing. These require photoperiods under 14 hr and/or temperatures under 60°F for floral initiation. As the name suggests, these plants generally bear fruit in the spring only, unless grown in areas with cool summer temperatures such as coastal California. A. Long-day. Lengthening days promote more-or-less continuous flowering throughout the summer, provided temperature is not too high. B. Day-neutrals. Photoperiod has no effect on flowering. Also will flower several times per year, but would do so in short as well as long days. Temperature may interact or override the photoperiodic effect in all types of strawberries. Basically, cool temperatures promote and warm temperatures inhibit flowering. The short-day types dominate the industry, but day-neutrals are increasing in importance in the USAMajor California cultivars in 2002 were ‘Camarosa’ (40% of acreage), ‘Diamante‘ (25%), ‘Aromas’ (2.5%), and ‘Selva’ (2%). Florida, the #2 state, also grows ‘Camarosa’ and ‘Selva’, and ‘Oso Grande’, ‘Sweet Charlie’, and ‘Rosa Linda’. Prior to the relatively recent development of F. X ananassa, wood strawberries (F. vesca) and Musky strawberries (F. moschata) were cultivated in Europe and Russia for centuries. These species were largely supplanted by cultivation of F. X ananassa over the last 250 years. In the early 1700s, inter-planting of F. virginiana (male) with F. chiloensis (female) in France led to production of hybrid seedlings that came to be known as Pineapple or Pine strawberry plants, progenitors of the modern cultivated strawberry plant, Fragaria X ananassa Duch. Native American strawberries were enjoyed by early settlers in the eastern USA, and in the early 1800s, F. X ananassa cultivars were brought to America from Europe. Plants selected in Pajaro, California became the basis of the California industry sited near Watsonville, the main strawberry region in California. World (2004 FAO) – 3,113,840 MT or 6.9 billion pounds. Strawberries are produced in 73 countries worldwide on 529,000 acres. Average yields are 13,000 lbs/acre. United States (2004 USDA) – 1,066,227 MT or 2.2 billion lbs. The industry value is $1.47 billion, and prices paid to growers are 66 ¢/lb for fresh, 28 ¢/lb for processed. Yields avaerage over 42,000 lb/acre. Leading states:California (86%), Florida (9%). Strawberry plants are perennial, stoloniferous herbs, meaning that they spread via stolons or “runners”. The leaves are trifoliate and arise from the “crown” (a reduced stem in the center of the plant). Leaflets are ovate or broadly oval, obtuse, dentate or coarsely serrate. The runners produce “daughter” plants at every other node. Flowers are white, about 1″ across, with 25-30 yellow stamens and 50-500 pistils on a raised, yellow, conical receptacle. Borne on a dichasial cyme, the center-most terminal flower opens first and is largest, producing the largest fruit. 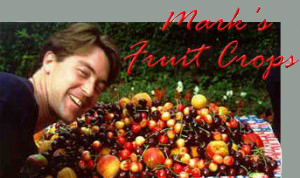 Most cultivars are self-fruitful and therefore do not need cross pollination for fruit set. However, bee activity is beneficial in transferring pollen to stigmas in an individual flower. The strawberry is an accessory fruit, since the edible portion is non-ovarian in origin (it is largely swollen receptacle tissue). 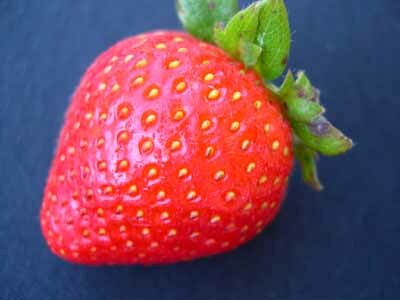 The true fruits which contain the seed of the strawberry are achenes, which are similar to tiny sunflower seeds. The achenes are the numerous, tiny, ellipsoid specks that cover the fruit surface. Fruit mature rapidly; ripening occurs in 20 to 50 days after pollination. 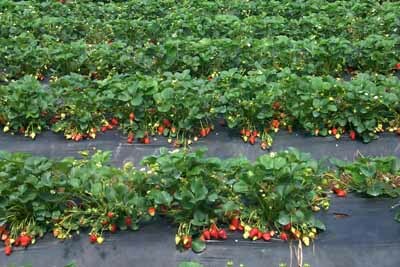 Sandy to loamy soils with good drainage and pH of 5-7 are best for strawberries. Depth is not important in most cultural systems, since plants are often grown for only 1-4 years, and develop only shallow root systems. 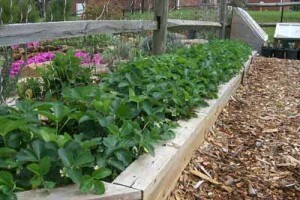 Strawberry plants are most often grown on 6-10″ raised beds to improve drainage. Soil fumigation is regularly practiced for strawberries, since several soil-borne diseases and nematodes are problems. For this reason, sandy, light soils are best. Methyl bromide has been used for fumigation, and its ban in 2005 triggered the filing of critical use exemptions by the US government on behalf of the industry. Strawberries have a cool temperate climate preference. Strawberries do so well in central Florida in winter, and in coastal California from spring to fall. However, they are sensitive to winter freezing. Crowns are killed at 10-20°F. 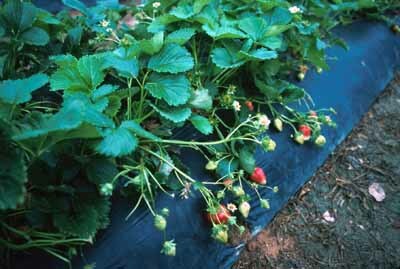 Strawberries have low chilling requirements to break dormancy, <500 hr at or below 45°F in many cases. Propagation is by division of daughter plants. Planting systems fall into 2 main categories: matted row and annual hill systems. Annual hill systems are typical of commercial production, and are fruited once and renovated, and usually intensively managed under “plasticulture”. Matted row systems are more typical of home gardens and processing operations, and are cropped for up to 4 years, then renovated. 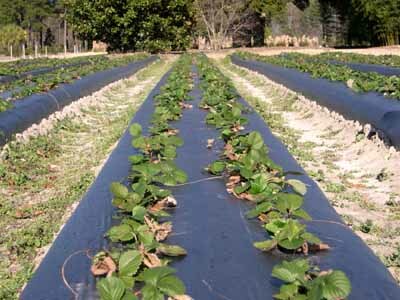 Whether matted row or hill system, strawberries are typically planted on beds 6-10 inches high to improve drainage around roots and provide discrete row middles for cultural practices and picking. The two methods of strawberry plant culture: annual hill (top 2 photos) and matted row (bottom 2 photos). Plastic mulch in the annual hill system prevents weeds, keeps berries clean, and warms the soil in late winter, which forces plants into early growth. Top left, a double row bed system in January after fall establishment of plants. Top right, looking perpendicular to rows in May during peak production. 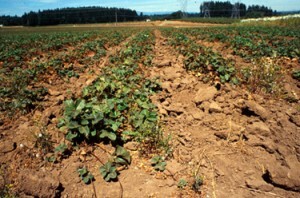 Bottom left, a matted row planting of ‘Totem’ strawberries used for processing in Oregon. The grower obtains 3-4 years of production, then renovates the site. Bottom right, a matted row bed in a backyard garden. Strawberries are ripe when red color covers the fruit. Strawberries are harvested by hand, whether for fresh market or processing. For fresh market, caps (calyx) are left intact; for processing, fruit are plugged (caps removed). Strawberries are extremely perishable, having a max storage life of only 5-7 days at 32 F and 95 % RH. They are either processed or shipped immediately. About 75% of the strawberries grown in the USA are sold fresh, and 25% processed (mostly frozen). Strawberries are higher in vitamin C than many citrus fruits. Per capita consumption of strawberries was 7 lbs/year in 2004.